Your survivalist's plane has crashed in the frigid Beringian north and civilization is miles away. Temperatures routinely drop below -20°C and the area is inhabited by Beringian snow leopards and brown bears. For miles the stark gray sky reflects the fresh blanket of white snow deposited almost every night. Scattered trees grew in contrast to the crevasses that unknowingly dip into the ground. How long can your survivalist last and more importantly, can s/he survive? 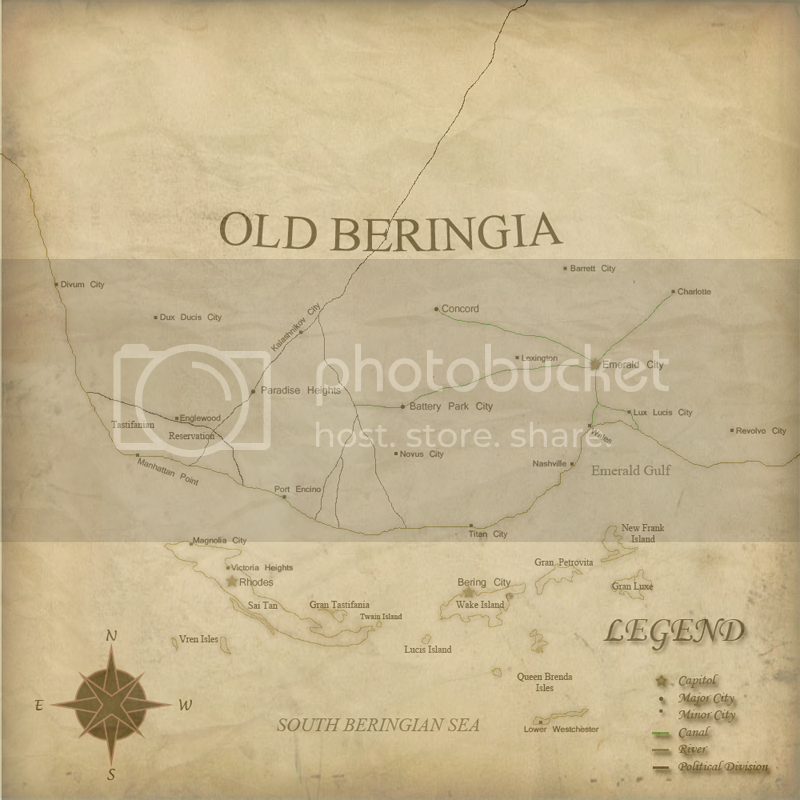 Last edited by Old Beringia on Wed Aug 13, 2014 8:30 pm, edited 14 times in total. Survival Experience: HAs been camping, but not really been much farther then a few hundred feet from camp. Dress(What are they wearing): A pair of blue jeans and a long-sleeve shirt. Last edited by Lizardiar on Mon Aug 02, 2010 5:54 pm, edited 1 time in total. As Mikhail woke up from the crash the cold wind that was nipping at his face burned the deep lacerations that riddled his body. He struggled to move and realized his safety belt was still engaged. Pushing the latch the belt didn't budge, it actually felt more like it had tightened around his waist. Mikhail reached for his backpack which revealed his outstretched arm, which appeared the be put into a blender. He let out a groan of pain and lunged for his backpack searching for his knife. Hypothermia had begun to set in as his shaking became amplified. He quickly cut his belt and fell to the floor of the plane. He then fell asleep. He was drifting in and out of a comatose state on the floor of the plane. His severe hypothermia was slowly killing him and if he fell asleep again he could very well not wake up again. He outstretched his pale arm once again for the books he had and began to systematically tear out pages crumble them up and stuff them in his shirt. With the second book he crumbled the pages and not tear them out. Once he was almost done he used his grandfathers lighter on the book for heat. The dead passenger that was next to him wore a heavy jacket that he didn't notice yesterday. He peeled it off the scorched body of passenger and wrapped it around himself. falling asleep again. The cold was so numbing, he didn't know his leg was broken. Today he decided that he couldn't stay, no one had searched for the plane and his chances of survival were dropping. He bundled up in any clothes he could find in the plane and stuffed his stuff back in his bag. He didn't bother to check the others bags or even if the radio equipment still worked. His judgment was clouded and the only thing on his mind was survival. When he crawled out of the plane the light blinded him and he didn't notice the snow leopard eating on the pilot's carcass. The leopard pounced knocking Mikhail to the ground, and it proceeded to tear into his neck. Last edited by Old Beringia on Tue Aug 03, 2010 2:11 pm, edited 1 time in total. Survival Experience: Special forces trained. 10 years experience. Items Carried(1 backpack for storage + Their suitcase): Assault rifle, 5x40 shot clips, multi-tool, combat knife, 3 smoke flares, 3 light flares, lighter, 2 liter canteen of water, fishing hand line & hooks, 50 yards of twine, waterproof lighter. Dress(What are they wearing): Camouflage fatigues (winter), winter weight jacket, Boots, socks, gloves, balaclava. For: Free thought, 2 state solution for Israel, democracy, playing the game. Are there no security on these planes that people are allowed to carry knives and guns? and why is the airline always crashing, how is it still in business? Build: Sturdy, but surprisingly fast on his feet if that proves neccessary. Survival Experience: Born & raised in the Eastern Mountains, as the child of a pair of hunters, he has subsequently travelled widely through the Northlands as a hunter and guide. Items Carried (1 backpack for storage): four knives of various sizes (one of which can, if the pommel on its hilt is unscrewed, double as a spear-head), hatchet, sling + pouch of c.16 suitable stones (for small game, such as hare or grouse), fishing hooks & line, whetstone, fire-starting kit, 2 [insulated] water-bottles @ 2 pints capacity each (full), 1 week's iron rations, mug, plate & bowl, small saucepan (for, e.g., melting snow to get more drinking water), fork, spoon, groundheeet, folding pick/snow-shovel, 30' ball of twine, 90' coil of [strong] rope, toothbrush & paste, small towel, personal first-aid kit, 'Sunstone' (piece of a mineral whose structure channels light in such a way that he can use it to tell the Sun's direction through light or medium clouds: this 'technology' was known to the RL vikings...) Oh, and -- although this isn't actually a 'survival' item, of course -- a wallet that contains his passport, travel tickets, & some money. Dress(What are they wearing): reindeer-hide trousers & hooded jacket, belt, boots. Special notes: He isn't human, he's an anthropomorphic Polar Bear (fully sapient, throat structure can produce 'human' speech, opposable thumbs, bipedal). Last edited by Bears Armed on Tue Aug 03, 2010 6:09 am, edited 9 times in total. Former Infantry Soldier on Uteria. ((Need Details? )), currently infantry soldier on Lemonius, little battle experience. Last edited by Lemonius on Mon Aug 09, 2010 11:32 am, edited 4 times in total. Strator wrote: Are there no security on these planes that people are allowed to carry knives and guns? and why is the airline always crashing, how is it still in business? Survival Experience: He's like the Asian version of Bear Grylls. Last edited by Jalanat on Thu Aug 05, 2010 11:58 pm, edited 2 times in total. My nation is not like my nation page at all, it contradicts itself, we don't EVER eat kangaroos, that's just very sad. Also vegetarianism is compulsory yet it still says it's the nation's favourite main course and all and stuff. Furry fan and proud of it! Survival Experience: Comes from a mountainous area, plenty of experience in mountaineering, 2 years miltary service. Items Carried(1 backpack for storage + Their suitcase): 3 books, a mobile phone, Swiss Army Knife, a first aid kit, various warm clothes (including a coat), a lighter and a fishing rod. Dress(What are they wearing): A sweatshirt, long waterproof terousers, socks, heavy boots. Going to use an IC character, but with a different name. Build: Normal. Not very bulky. Survival Experience: Has been trapped on two deserted islands and is has been a skilled escape artist for 2 years. He is also skilled in biology, allowing him to easily recognize plants and animals. Items Carried(1 backpack for storage + Their suitcase): 1 pistol, a knife, a short spear. Last edited by Alevuss on Sat Aug 07, 2010 1:36 pm, edited 2 times in total. But this is NS related. This is a NS related thing. This is a NS player. Last edited by Strykla on Tue Aug 03, 2010 9:27 am, edited 1 time in total. Lord Justice Clerk of the Classical Royalist Party, NSG Senate. Hail, Companion! Last edited by Goroslavia on Tue Aug 03, 2010 9:33 am, edited 2 times in total. "May the plague and her angels fall upon us we are ready!" Goroslavia stands on the brink of the largest conflict ever known to man. We shall not back down rather we shall meet this great war with sword in hand. And if Goroslavia does perish she only ask that it be known of her loyalty. He going to a war? That's a little of over preparing on his part isn't it? Last edited by Lizardiar on Tue Aug 03, 2010 10:33 am, edited 1 time in total. Jak woke up dazed and irritated. As he came closer to reality he unlatched his belt to reveal a rod protruding from his side although the blood didn't seep out due to the cold. As he tried to maneuver off of the rod he pulled himself free smashing his head on the seat in front of him. He clasped his hands around his now bleeding skull. He looked to his left and searched through his backpack for something he use to patch his wound temporarily. He sat in the plane for a while and collected his stuff. Upon searching the other passengers items he found nothing useful aside from a .357 pistol and 20 rounds, some clothes and other things he already had. His suitcase containing his rifle and ammunition had been crush in the impact of the crash and was unobtainable because of his wound. Jak crawled out of the plane and stood up spotting a snow leopard resting near the plane. The cold revolver in his hand being the only chance he had of survival. The leopard watched as he pulled back the hammer. He was barely breathing as the leopard lifted it's head and started to sway it's tail. He quickly fired off three rounds killing the beast and granting him a meal for a while. He dragged the corpse into the plane which he would stay in for the time being. Until it was dark he piled snow around the open areas of the plane to keep in heat. Last night he had divided up the edible parts of the snow leopard for dinner and breakfast the next morning. He wondered how he would get out of this predicament. Should he stay and pray for rescue or move south and hope he would better his chances for seeing other people. The last pieces of meat were packed up in the pages of a newspaper he found and he crawled into the wilderness once again. Noting the position of the sun in the sky and the time he proceeded south. He managed to find another snow leopard that night and built a makeshift igloo before it began to snow again. The morning of day three he burrowed out of the snowed in igloo he built and kept limping south. Same routine as the day before, but there was no meal he could prey on tonight. He wasn't counting on getting very far he nearly slid into a crevasse last night and pulled something. It was snowing that day and it had gotten dark. As he began walking he noticed a pickup-truck in the distance as he walked closer he realized it belonged to someone. He wasn't going to bet on them being friendly as most hunters in the Beringian North are bitter war veterans that will kill you and use your carcass for bait. Luckily the hunter wasn't in the truck and he had plenty of provisions and food to last for days. He scrambled trough the cab for medical supplies finding them and started the engine. But the hunter was standing infront of the truck, the hunter took aim and Jak pressed on the gas ramming into him and killing him. He turned the truck around and drove south to Divum City where he was cared for and put on a plane back home. Survival Experience: Like any seasoned Fatatatutian soldier, she is able to survive indefinitely in the bush, without supplies and without losing any weight. However, she has no knowlege of the Beringian flora and fauna and no cold-weather experience. Items Carried(1 backpack for storage + Their suitcase): extra clothing, lightweight sleeping bag, extra blankets, canteen, MREs, first aid kit, sewing kit, flint, machete. Dress(What are they wearing): boots, pants, T-shirt, shirt, jacket. A spear? Eh simple enough. Che wakes up to discover his cumbersome jacket greatly hindered his movement. He struggled for about 20 minutes before he successfully unlatched his belt. He rested for a few minutes and quickly got out of his seat grabbed his backpack and rushed out into the wilderness. He immediately checked his watch and looked toward the sky. He dropped his bag to search the plane finding a firefighters axe. Upon exiting he marveled at a snow leopard searching his bag, undaunted by Che staring at it. Che raised the axe and suddenly the leopard became aware of his presence. He raised the grip of the axe above his shoulder and the leopard pounced. The smashed the heel of the axe into the leopards face but it was relentless. It clawed into Che's coat and he pounded at it's face with the axe before dropping it and resorting to hand to claw combat. He reached for it's neck but to no avail, what was left of the coat hindered his movement. Survival Experience: Having been born to a family living in the northern most reaches of Wallenbergia, in the laanden of Fraamboorg, Ivaarjaard has been being taught how to survive in the wilderness since a very young age. Him, and his father made many a hunt in the freezing forests of the North, and his father bestowed young Ivaarjaard with essential knowledge passed down from his father, and his father before him. When Ivaarjaard turned 19, and was conscripted into the military, he opted to be assigned to one of the Mountain Divisions. Though he saw no combat during his time in the 3rd Mountain Division, he recieved all of the training none the less, and was noted to be a prime candidate for the Wallembergish Jegaare Regemente. Military officials knew it would be a waste of his talents not to have him put in this unit, and so he was transferred over. The only action he saw while in the regiment were a few small missions, including escorting a group of scientists to their destined research facility, and a small operation involving the protecting of said research facility from potential attack. Items Carried (1 backpack for storage + Their suitcase): Wallembergish Krigsknijv (War knife/Combat knife), P-67/24sd handgun, binoculars, two changes of clothes, a camoflaged, portable tent, 8 packages of dehydrated food, a scoped Gemmler & Jung K-05/62 bolt-action rifle, with 2 extra magazines, and 4 boxes of ammunition. Dress (What are they wearing): Wallembergish Jaegaarregemente snow uniform: snow camouflage parka, and pants, along with the issue Winter undergarments, snow boots, with issue gaiters, a pair of cold-weather gloves, a leather belt, with attached pistol holster, and magazine pouches, along with Ivaarjaard's self-made fur hat. Last edited by Wallenbergia on Tue Mar 13, 2012 9:11 am, edited 11 times in total. Dȫber wakes up in a strange orientation. The plane crashed and flipped landing upside down. He couldn't really see much but he didn't know if it was due to his blood rushing to his head or the fact that it the sky had dumped around 14 inches of snow the earlier night. He tried to move but to no avail, the numbing pain of being upside down paralyzed the extremities of his body along with the cold. For nearly two hours he tried to move his legs, arms, fingers, to try to get a response and the feeling back in his limbs. Finally he could move his pointer finger, his thumb, middle finger and eventually the rest of his hand. Dȫber reached for the latch on his safety belt and released it causing him to fall on his neck. Over 178 pounds of force all placed upon his neck in an instant.